*First, yesterday's post may have made it seem like I'm some sort of Grammar Nazi. I'm not. I let multiple grammar mistakes go everyday...in my classroom. It's not worth the battle. The "yea/yeah" thing had just been bugging me for years because, in my experience, everyone thought I was the one with the problem. I needed to get it off my chest. These blondies are an oxymoron. There's a lot of "treats" out there that use healthy ingredients but usually the blogger baker insists it "doesn't taste healthy at all!" That's nice, I always think. They always taste healthy. These blondies taste like they could be healthy....but they're not. So I have no tagline to pull you in. I was looking for something to do with a jar of Cookie Butter. This is what happened. Easy? Yes. Tasty? Sure. Healthy? Eh. There's no added sugar or oil, so I suppose that's a plus. Actually, yes, they are healthy. They have eggs in them. Protein. We can call them healthy. In a bowl, whisk together the cookie butter, vanilla, and eggs. You can warm the cookie butter first to make it easier, but not too hot or the eggs will "cook". Slowly incorporate the flour until well-combined. Spoon into a greased mini-muffin pan. Bake at 350 degrees for 10-12 minutes until browned on top. I'm early this week. Kindness is kindness, no matter the day you publish it, right?? Speaking of baked goods, this week I took something to school for my co-workers. Someone asked me last week if I was ever going to bring anything in to share again. I took the hint. Apple Butter Banana Bread went to school with me to be shared. Because I buy bananas with the intention of consumption. And then that doesn't happen. So I freeze them or bake with them. Along with that, I made what I'll call Cookie Butter Fudge. It was an experiment and turned out quite well (how can sweetened-condensed milk go wrong?). Also, I gave away a Target gift card on Mrs. K's blog last week. Abbey won and I was more than happy to send it her way. Congrats Abbey! Also, I need to start sharing some inspiring blog posts. Kelly and Greg's paleo story was an awesome read. Totally inspiring. Check it out! Did you do anything randomly kind this week? 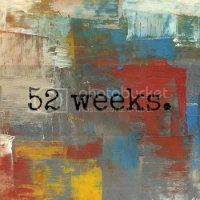 This 52 Weeks project is changing my way of thinking, but it's not making me happier on a daily basis. You'd think I'd be more willing NOT to curse the cold/snow/darkness or NOT to yell at the person driving 15 mph in an attempt to show my inner happiness and gratitude. But that's not happening. I think this is more than a mindset change. Maybe I'll figure things out when I'm 51 weeks in. I've still never tried cookie butter. I think I might need to head to Trader Joe's this weekend to buy some! Ahhh I must have these haha. They look amazing! Those look good...and easy. Although I am a fan of Nutella so those brownies sound good too, haha. I've never tried cookie butter but I'm going to have to make these! What does cookie butter taste like? These are kind of genius Kristin! Totally want them right now! i've never had cookie butter before! i want those muffins but really really want that banana bread! I've never tried cookie butter, but you have mentioned it several times and it always gets me wanting to try it. You should totally be a cookie butter sales person. And (since I didn't comment yesterday) I always get yea/yay/yeah mixed up.I even know that I am probably mixing it up when I am writing it out, but I am too lazy to figure out which one I want to use. I have never even heard of cookie butter, but it sounds fabulous! These treats look delicious! I feel an overwhelming desire to make these. Sooo, being that I am a Nutella lover, you're saying that instead of that 1c of Cookie Butter I should use Nutella?